Everything in the Beijing Municipality seems to embody the definition of 'vast'. Over 19 million people currently live within this municipality. The city's road systems are monumental constructions, as are the buildings, which are monuments to the city's enduring role as the seat of communist government power in China. Beijing also lays claim to being the country's cultural centre. In 1989, one particular part of Beijing came to the world's attention when pro-democracy demonstrators waged war with army tanks. Tiananmen Square might look like it is straight from a Maoist textbook, being a place well-suited to large-scale communist parades, but it also has roots in traditional Chinese culture. In fact, if you dig beneath the veneer of the modern city, it is not that hard to find hidden pockets of Beijing's historic roots. There is been some sort of settlement here for more than 3,000 years. During the 13th century, Kubla Khan built this city up as the capital of his empire, meaning that Beijing has an abundance of palaces and temples. Stone walls and gates are also reminders of the city's imperial opulence and splendour. In total, there are over 3,000 cultural heritage sites, including the Forbidden City, the Temple of Heaven, the Summer Palace and the Ming Tombs. The Great Wall of China runs through the municipality, too. Outside of the city itself, there are around 30 lakes of all shapes and sizes, as well as some 20 nature reserves and a fair number of forests. Beijing is also surrounded to the west, north and north-east by some rather impressive mountains, of which Mount Lingshan is the tallest. 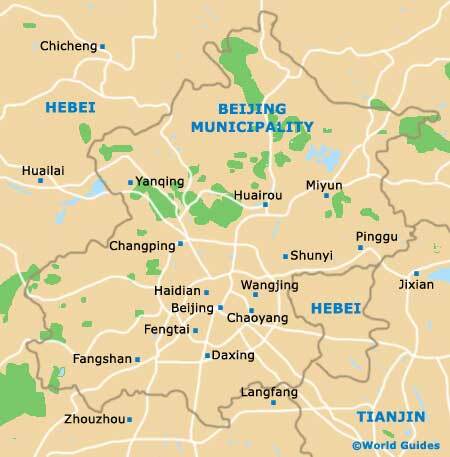 The urban centre of Beijing has its very own dialect, which is based on Standard Chinese. Whilst it doesn't tend to cause problems with communication, fluent Chinese speakers will be able to spot a native quite easily, simply by the way that they speak. Beijing is known the world over and has become one of the most famous cities in China. Home to some outstanding landmarks and ancient temples, Beijing is very much a buzzing city and is close to a popular stretch of China's Great Wall.